My family and I are truly thankful for each and every order and we hope you love each design that you purchase. Thank you for stopping by and we hope if you haven't ordered from us before that you will and that you will love your TSF Design! Hello! My name is Emma Shelhorse and I am the creator of TSF Designs. I am a stay at home mom who does this to save extra for our daughter & better her life. I love creating custom designs and being crafty, thank you for supporting me! Welcome to TSF Designs! We are a Mom & Dad team who do this all out of the office in our home! I am a SAHM to our four year old daughter and we LOVE anything monogram or personalized. Let us help you with the personalization in your life! We create vinyl decals for your everyday items as well as wall decals and heat press designs! We will happily create custom orders, please just send us a message :) Thanks for stopping by! Due to the nature of our product and the fact that they are ALL custom orders, TSF Designs will not issue a refund or offer an exchange for an item you do not like once received or for an improper input monogram when ordering; ALWAYS input the monogram in the order you would like it to read and we request in ALL CAPS to prevent any miscommunication. TSF Designs will also not allow cancellations of any order for any reason, once an order is received we immediately begin working on your order in order to complete them and ship to our customers in a timely manner. TSF Designs will not be held liable if the customer inputs the wrong initials, misspells an item or does not like how it looks once received. We provide examples for all fonts used in our decals as well as an accurate color chart, if you have any questions about fonts or colors PLEASE message me BEFORE you place your order. Some fonts are "choppy" in style and colors may not be represented as they are depending on the device your shopping from or the screen. If you have any questions about the font style or concerns about your lettering please message me before you place an order. Sometimes letter combinations are not as pretty in some fonts as they are in others, additionally, some fonts are designed to create a shape like a circle, diamond, etc. this means the lettering is manipulated to create a shape. TSF Designs will do not issue refunds if you do not like the way your letters look when you chose the monogram style, so please if you have any questions or concerns, contact us before you place your order. We also will not replace any decal that is damaged during the application process, we apologize but that is another risk of purchasing items online. It is imperative that you follow the instructions given, if there are issues please send us a message and we will be happy to offer some advice. But if a piece rips off, does not transfer, etc we will not issue a refund or replace the item. All orders are shipped through USPS. 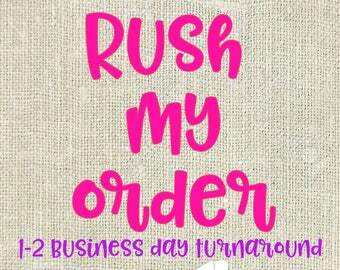 If your item requires a RUSH shipment please message us, so we can adjust such fees on your order. Shipping time frames are based on the USPS and can range 5-7 business days, sometimes much sooner. Unfortunately sometimes shipping may take longer, which is completely out our hands,as we can not control how quickly USPS transfers and delivers items or unforeseen issues. We do not offer tracking numbers for our products, unless requested by the customer and alternate arrangements are made; we do have a listing for tracking information that can be purchased when placing your order. We are not responsible for lost or stolen packages when shipping and will not replace them. If you would like extra assurance please message me so that we can make other arrangements. It is the customers responsibility to ensure the address they are inputting while TSF Designs is correct and TSF Designs is not responsible if you address is incorrect and the order is returned to us. If an order is returned and there is no error on our part, it will be the responsibility of the customer to pay for shipping again. Please make sure that you have checked your shipping address to ensure it is in fact correctly listed, if it is NOT please message me IMMEDIATELY so I can make a note on your order for the correct address. Insurance on orders will not be offered unless requested by the customer, if you require insurance on your order please message me before you place it so I am aware and can ensure the required fees are applied to your order. Please remember that the vinyl DOES NOT stick to ALL surfaces, do NOT try to apply it to multiple surfaces, doing so may cause the stickiness to be removed. Step One: Clean the area thoroughly; make sure to completely dry the area after using any cleaners/rags. Even small bits of dust and debris can prevent the decal from properly bonding to the surface. Step Four: Starting from one end of the decal, peel the decal’s transfer tape (clear or opaque) off of the surface. The key here is to peel very, very slowly. Be sure to peel the decal’s transfer tape back at a sharp and low of an angle as possible rather than pulling the transfer tape straight up and off. Peeling back and low pulls the transfer tape off the surface without pulling the vinyl decal off with it. If the decal pulls away from the surface repeat Step 3. The vinyl decal cover will peel off easily, and it shouldn’t leave any residue behind. In the event the cover leaves adhesive residue on the window surface, use a small dab of Goo-Gone to wipe it away.